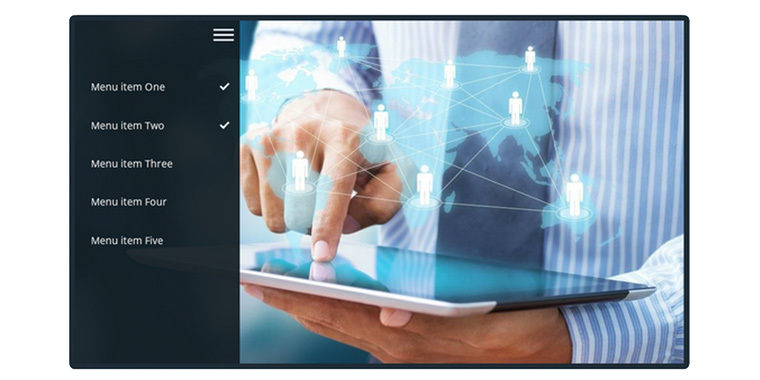 Intuitive navigation is an important element in e-learning design. Course designers who stick with default player menus usually don’t have to worry about user interface (UI) design since player manages the navigation. One reason rapid e-learning became so popular with instructional designers is because the tools generated the course menu, freeing IDs to design content rather than program course menus. If there’s a downside to prebuilt menus, it’s that they encourage linear, click-and-read courses. Custom navigation menus, like those often used in nonlinear courses, can permit learners to jump around the course as they choose. But moving beyond traditional menu navigation means course designers need to think more like UI designers. To jumpstart this week's challenge, I’ve rounded up some creative navigation examples your fellow community members have shared. Video game consoles, traditional board games, and tablet-inspired menus are excellent ways to seek inspiration. 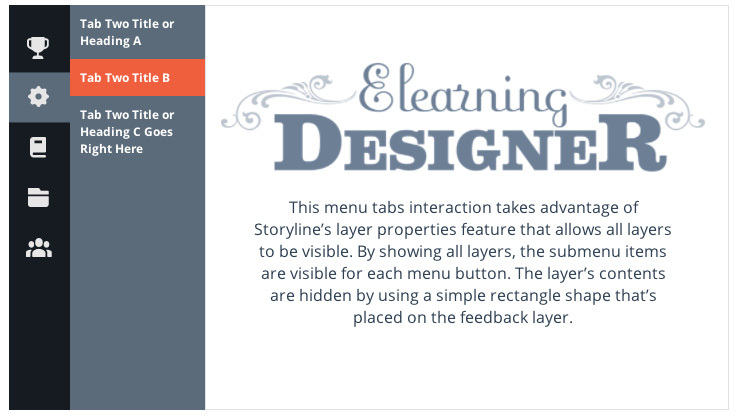 Tabs are the most popular type of menu navigation we see in courses. They’re highly customizable and can be created using a variety of shapes and styles. If you go with a tabs menu, please cross-post in the tabs challenge. Icons and graphics are another popular approach to course menus. When used consistently, visual buttons can remove the need for on-screen button labels. If you’re looking for tips on building your own icons, check out last week’s icon e-learning challenge. This mobile-inspired menu includes bookmarking features to indicate completed lessons and a collapsible menu to free up slide space. 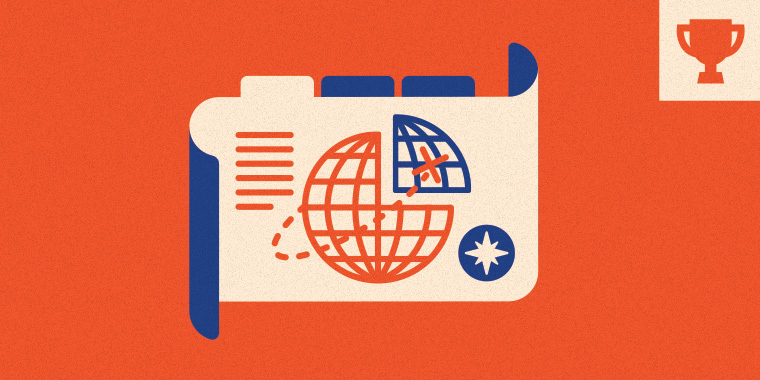 Similar to the icon-based navigation, map themes are a creative alternative to text-based menus. Nicola shared a branching example based on a village illustration. You can design any kind of menu navigation you like. The focus this week is more on navigation ideas and concepts. Don’t worry about putting together a highly polished menu or interaction. Here are some tutorials and articles that will help you create your challenge demo. Here are a few website navigation showcase examples that can help give you some ideas. If you come across a site or example that you think would benefit this challenge, please share in the comments below. I’ll update the list with your recommendations. 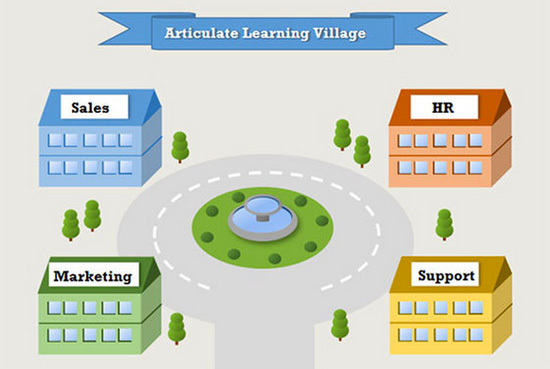 Wishing you an easy-to-navigate week, E-Learning Heroes! Nice navigation in this one, Jackie. I like how you visualized it. Reminds me of the Thumbnail view in Articulate Studio'09 (only better). That menu is gorgeous! Love it! Here is a menu system that allows learners to select topics they are interested in and effectively build their own course: http://wp.me/p2BoUf-8R The selection is done with drag-and-drop. Based on the topics selected, a progress indicator also auto adjusts to shows the correct progress %. This proof-of-concept was about the functionality only, I didn't spent any time on graphic design. So creative, Michael! I like it and it works beautifully. Love the progress meter, too. On the user side, I kept wanting to return to my custom menu so I could jump around from there, but it returns to its initial state when I go back. (Obviously easy to change.) Far more importantly - you proved your proof of concept! Thanks for sharing it! Well done Michael and thanks for sharing your blogpost. Besides this I really like the topic (drones) you've used. For a few months back I was experimenting myself with the Phantom and GoPro. Any change that we can catch up on the 8th of May (after the Articulates user day in Munich)? Hi Paul, if you are interested in drones, you should chekc out the new DJI Phantom 3 (http://www.dji.com/product/phantom-3) and 3D Robotics Solo (http://3drobotics.com/solo/) drones. I really love this idea Michael, you really thought outside of the box on this one! Consider me impressed Mr. Hinze! Wow! Really impressive mechanics and I love the main idea. Very cool. I knew I'd see both of you early in this challenge:-) Michael - I updated the resources to include your article. That's a good post and will likely help a lot of users. Jackie - I added your magazine example to the animated menu examples. #LoveIt Nancy. Great style and use of the 'menu button'! Are the drawings that you used your own? Hey Paul - some of the graphics are mine but most are stock. The button is a custom tab. I put the menu itself on a layer in the slide master. I wanted a way that I could overlay a menu with a transparent background on top of whatever slide content was open when a user clicked the menu tab and I did not want it to appear in a lightbox. My example is a little over the top but I can see lots of application for this in more traditional courses for anyone who wants something other than the built in player menu. Nice alternative to the usual, Nancy. Very clever and creative. I like it! Just goes to show you it can go in any direction - very artsy, Nancy ! Never know what's around the corner. Not so evident which keeps it fun and the user guessing. Great work. You've done it again! Really enjoyed the visuals. Thanks for sharing Alex, great job on the animations! I like the way you used animations in this one. Nice play with colors! Very stylish. This is the reason I have a "Project Playground" - waiting for a challenge that matches something I've been working on! I've been designing a notebook template which absolutely focusses on navigation, although the design would also fit into a previous challenge - I just haven't finished it yet. I've revisited the project and there's a lot of design stuff that I think is worth sharing at this point. I haven't looked at the template for a while, but hopefully I'll be able to finish it to share as a free download for this challenge. I remember to navigation took me a long time to perfect! Here's the link to the page in my Project Playground where I set out the process I used to create the design and share some visual images on what the final design will look like. http://bit.ly/1PZKP3Y Watch this space for updates! Four submissions before the end of day Friday? That has to be some kind of record! I'd help in a heartbeat! Great challenge! Below is a link to my submission. It's a gamification example I've been working on. It takes advantage of a map-style menu. 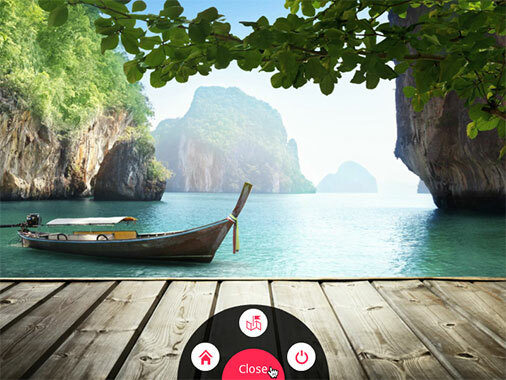 View demo here: https://dl.dropboxusercontent.com/u/96124270/Quiz%20Gamification/story.html From a UI perspective, I like that this style of menu is easily used on a computer or mobile device. The buttons aren't too big or too small. Also, because I've removed the built-in player/menu features, I like how it has an app-like feel. Nicely done Tim! I admire your style of design. Awesome Tim. Like always...a great design! Especially the bright colors are amazing and a well choosen fit for this adventure. I like your design, color scheme, and graphics! Impressive. Did you create all the graphics yourself? Really great work Tim, beautiful design. How long did it take you to build? Great idea, Tim. I like the map very much. Did you design it directly in SL? Very user friendly, and extremely well presented! That was fun Tim ! Thanks. Nice work. It's given me some great ideas. Thanks. Tim, beautifully made. I love how the design work pops out yet keeps the module simple. This is so cool!!! The whole visualization is so colorful, the map, buttons, character selection. Moreover, I think this is a great statgey for creating end of course assessment!! Nicely done Wilson, I think I noticed you coffee cups Icons form last week challenge. Great job! Thanks Paul. I like to recycle! I like the extra detail you added, such as the steam radiating from the coffee cup icon. Well done! Coffee icons great and with steam adding movement making it look real, Wilson. Like your tv icon opening up videos. Like how content/images move in from sides with diagonal division of colours. Very "tasteful" (pun intended). Thanks Daniela. I do some of my best thinking over coffee. I tend to have a latte on my mind! Great job Wilson...loved everything about it! First Example My imaginary example is about animals you would see on an African safari. I created two slides as menu mock-ups in PowerPoint. http://www.wtsolutions.biz/wp-content/uploads/2015/04/African-Safari-menu.pptx When users click an animal box, they are taken to a slide with either a photo and written information or, perhaps, a video. Second Example I used the Simple Tabs Interaction template to show my company's services. http://www.wtsolutions.biz/wp-content/uploads/WTS%20writing%20process/story.swf Note: There is a player menu but it is not essential. Great job Adrienne, nice use of color scheme and your tabs interaction is spot on! Nice entry Rachel. This is what freedom of navigation is all about! Great idea for outlining areas of a resume Rachel ! Nicely done. Now, can you tell me where you got the music. My daughter wants to know. I liked it too. Something soothing about it. I was trying to figure out what instrument it was. Thanks for sharing ! Thanks Rachel. Great site for music !! Again, really liked how you chose to break down a resume. Gives me the idea where this can be used for other content needing defining further. Creative ! A very logical navigation approach, indeed! Well done. What a great challenge David and thanks for mentioning my portfolio template. For a few weeks ago I started to catch up the previous challenges. In this context, I developed a mobile template for an iPhone 5 and 5S which I 've added to challenge # 2 . Because of the navigation which I used in this template , I think that this challenge is also a good match for sharing . Follow the link below for a demo version. I added a download button for those people who want to use this template for their own purposes. http://www.eyespirations.com/portfolio-item/tabs-interactions-elearning-challenge-2/ Enjoy! I love the look and animation on this one Paul! Very clean and easy to navigate, Paul. Thanks. As always, great work Paul! Very colourful Linda and easy to navigate. You have a talented son. Must get that from you. Wow, the visual flair really does run in your family. I do photography, and your son's work is really good; his images are striking, and capture the excitement of the events. And your presentation is sleek and hip! Thanks so much Andrew, I'm going to show him your comment! Here's my entry for this week. Originally I was going a different direction but this morning I woke up and thought of this. http://bit.ly/1Eh8F8d I've been absent for the last couple of weeks because I've been very busy. I started a new job and moved into a new house I had custom built. Great job Nigel! I really like the look of the main menu and the animation that shows the topic name. I absolutely love this! But FYI: when I tried to download the file to check out your animations, I got a Page Not Found message. Great example! Can you share you source file so that we can see your animations? The button doesn't seem to work! Thanks! I wasn't sure where to start so I searched for inspiration. I found a site: http://www.fantasy-cartography.com/ and thought I would try to use some design elements from it. I wanted to include content of interest so I found this site: http://www.litmos.com/blog/instructional-design/6-steps-better-instructional-design So I played with this while watching the NHL hockey playoffs and came up with this: https://googledrive.com/host/0B4cWLl4F_TnfflhFdDF1a0J3dTJrMFpTdjMxS0J5UEtEUVd6ZHkzYkFTNkZXdVZRMDZtaFE After I posted this, I went back in and added music (inspired by Rachel Barnum) but it seems to be struggling during the loading process into Google Drive. The above link may not work at this time. Will keep trying. The issue I am having now is the transparency of the image behind the text which is not showing transparent so I will take the images out for now. I posted a question in the Discussion Forum. This seems like a great topic. I hope I can get something out this week and contribute! Love it Ashi. Navigation buttons look like ornaments falling off a tree. Neat font. I like how you used the icons to state "not in preview". I didn't think of doing something like that. I think I am trying too hard in the wrong direction. ....still learning....thanks for the inspiration ! Looks great! Holds the learners interest. Ashi, how did you move the green shapes with the text at the same time. I have used PPT for many years and I know how to use it there. But in SL2, the shape goes first then the text? Thank you so much Ashi. What a great support family - you are so kind ! Really like this one, Ashi. Good choice of intro music too. Mel, what you did was not crazy to me. Each element of your creation allowed me to see that simplicity works. Using animation to bring in "Course Title", navigation buttons on the right, pictures in the background, and easy to navigate all works for me ! I also noticed most people are using the latin (lorem) text to fill in content for these. Lesson learned: Spend less time searching for content and more time with creative for these challenges!. Thanks. Nice Mel, it makes me want to be outside. Simple, yet effective and stylish. Great job! Loved the feel of the first ocean image carrying through in your navigation shape & color! Hey guys, I just uploaded a new free Flat template to challenge #4 Because of the navigation I used I would also share it in this challenge. Here it is...there is also a download for SL1 and SL2 http://www.eyespirations.com/portfolio-item/free-flat-elearning-template/ Enjoy! I did enjoy that Paul. So much talent in the house. Thanks for allowing me to download. I am learning so much from everyone. Thanks for the nice comments guys. Feel free to contact me, if you have any questions about the template! This is awesome, Paul. Really like the clean and intuitive design. Thanks for sharing. Cute slider Alexander. Loved the expressions on the two characters when they don't get chosen ! Bravo. Love it Matt, very attractive, clean style. Awesome, Matt. Easy to navigate, nice Go and Done buttons, easy to go back to home page. The navigational indictors work well. Overall I think it's great. Nice work! Oooh, I really like this one; creative, clever, and clean. Nice! Daniela, Both the links are showing an error notification.